I owe a debt of gratitude to Yelli for the warning that Lidl’s American Week started today. 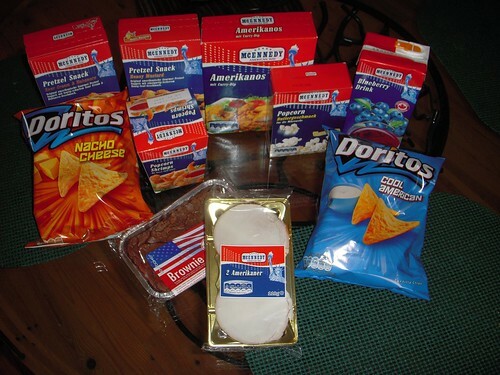 I popped into my local Lidl to see what was on offer–and amazingly I could sort of see a connection for most items to America. Doritos, ok. Brownie, ok. Amerikaner, not really. New this time, or at least that I noticed this time was that old traditional American favorite, blueberry drink. I decided to be brave and buy some, even though the package claims to have “Wild Canadian Blueberries”–nothing like the Statue of Liberty right next to the Canadian Maple Leaf, although we’ve seen that before. wow, you really bought it all! Really? You bought all this crap!!! Don’t knock down the brownie. It was pretty good! Sour cream and habanero sounds pretty good. I don’t think they sell them anywhere else and I, for one, have never had one. Happy American week! Hey, Fellow elmada-Blog-Buddies, Adamo needs to buy groceries one way or the other. It’s cool if he chose to spend all his grocery money on weird stuff, just because it was marketed as having some vague connection to the US. I almost feel like getting in a train and going up to Weimar just to help him enjoy his (?! )”American” bounty. Remember, Adamo is an expatriate, NOT an ex-patriot! I would be totally speechless as well — unless it was delivered by somebody who I knew was good at telling jokes with a straight face. Cool American Doritos? Do they not have a concept of what a ranch is in Germany? It wouldn’t surprise me, but I suppose if native German speakers did not understand the concept it could be explained somehow through the concept of farm, and the rest explained from there. To me, “ranch” denotes a range of flavors/seasonings that is common in American cooking. Although Germans understand what a ranch is (as well as a farm), I think using it to denote a flavor wouldn’t result in sales. That said, the “ranch” flavor is unmistakably American, so “Cool American Doritos” is probably a good hint at what it will taste like. I can’t actually think of anything else in Germany that carries that ranch flavor–certainly not even salad dressing.